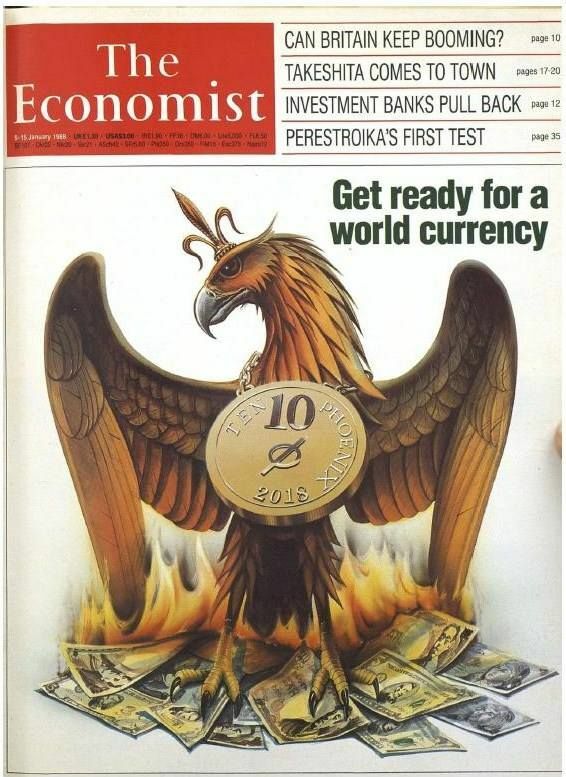 The article continued in stating that, “There is now a world currency in waiting. In time, SDRs are likely to evolve into a parking place for the foreign holdings of central banks, led by the People’s Bank of China.” Further, “The creation of a Financial Stability Board looks like the first step towards a global financial regulator,” or, in other words, a global central bank. It is important to take a closer look at these “solutions” being proposed and implemented in the midst of the current global financial crisis. These are not new suggestions, as they have been in the plans of the global elite for a long time. However, in the midst of the current crisis, the elite have fast-tracked their agenda of forging a New World Order in finance. It is important to address the background to these proposed and imposed “solutions” and what effects they will have on the International Monetary System (IMS) and the global political economy as a whole. On January 1, 1999, the European Union established the Euro as its regional currency. The Euro has grown in prominence over the past several years. However, it is not to be the only regional currency in the world. There are moves and calls for other regional currencies throughout the world. Currently, Africa has several different monetary union initiatives, as well as some existing monetary unions within the continent. One initiative is the “monetary union project of the Economic Community of West African States (ECOWAS),” which is a “regional group of 15 countries in West Africa.” Among the members are those of an already-existing monetary union in the region, the West African Economic and Monetary Union (WAEMU). The ECOWAS consists of Benin, Burkina Faso, Cote d’Ivoire, Guinea, Guinea Bissau, Mali, Niger, Senegal, Sierra Leone, Togo, Cape Verde, Liberia, Ghana, Gambia, and Nigeria. In January of 2008, I wrote an article documenting the moves toward the creation of a North American currency, likely under the name Amero. [See: Andrew G. Marshall, North-American Monetary Integration: Here Comes the Amero. Global Research: January 20, 2008] I will briefly outline the information presented in that article here. In 1999, the Fraser Institute, a prominent and highly influential Canadian think tank, published a report written by Economics professor and former MP, Herbert Grubel, called, The Case for the Amero: The Economics and Politics of a North American Monetary Union. He wrote that, “The plan for a North American Monetary Union presented in this study is designed to include Canada, the United States, and Mexcio,” and a “North American Central Bank, like the European Central Bank, will have a constitution making it responsible only for the maintenance of price stability and not for full employment.” He opined that, “sovereignty is not infinitely valuable. The merit of giving up some aspects of sovereignty should be determined by the gains brought by such a sacrifice,” and that, “It is important to note that in practice Canada has given up its economic sovereignty in many areas, the most important of which involve the World Trade Organization (formerly the GATT), the North American Free Trade Agreement,” as well as the International Monetary Fund and World Bank. The summary states that, “The same commercial efficiencies, economies of scale, and physical imperatives that drive regional currencies together also presumably exist on the next level—the global scale.” Further, it reported that, “The smaller and more vulnerable economies of the world—those that the international community is now trying hardest to help—would have most to gain from the certainty and stability that would accompany a single world currency.” Keep in mind, this document was produced by the IMF, and so its recommendations for what it says would likely “help” the smaller and more vulnerable countries of the world, should be taken with a grain – or bucket – of salt. Amidst fears of a falling dollar as a result of the increased open discussion of a new global currency, it was reported that, “The dollar’s role as a reserve currency won’t be threatened by a nine-fold expansion in the International Monetary Fund’s unit of account, according to UBS AG, ING Groep NV and Citigroup Inc.” This was reported following the recent G20 meeting, at which, “Group of 20 leaders yesterday gave approval for the agency to raise $250 billion by issuing Special Drawing Rights, or SDRs, the artificial currency that the IMF uses to settle accounts among its member nations. It also agreed to put another $500 billion into the IMF’s war chest.” In other words, the large global financial institutions came to the rhetorical rescue of the dollar, so as not to precipitate a crisis in its current standing, so that they can continue with quietly forming a new global currency. Guillermo Calvo, Professor of Economics, International and Public Affairs at Columbia University wrote an article for VOX in late March of 2009. Calvo is the former Chief Economist of the Inter-American Development Bank, and is currently a Research Associate at the National Bureau of Economic Research (NBER) and President of the International Economic Association and the former Senior Advisor in the Research Department of the IMF. In February of 2009, the Times Online reported that a “New world order in banking [is] necessary,” and that, “It is increasingly evident that the world needs a new banking system and that it should not bear much resemblance to the one that has failed so spectacularly.” But of course, the ones that are shaping this new banking system are the champions of the previous banking system. The solutions that will follow are simply the extensions of the current system, only sped up through the necessity posed by the current crisis. Ultimately, what this implies is that the future of the global political economy is one of increasing moves toward a global system of governance, or a world government, with a world central bank and global currency; and that, concurrently, these developments are likely to materialize in the face of and as a result of a decline in democracy around the world, and thus, a rise in authoritarianism. What we are witnessing is the creation of a New World Order, composed of a totalitarian global government structure. Indeed, the current “solutions” being proposed to the global financial crisis benefit those that caused the crisis over those that are poised to suffer the most as a result of the crisis: the disappearing middle classes, the world’s dispossessed, poor, indebted people. The proposed solutions to this crisis represent the manifestations and actualization of the ultimate generational goals of the global elite; and thus, represent the least favourable conditions for the vast majority of the world’s people. It is imperative that the world’s people throw their weight against these “solutions” and usher in a new era of world order, one of the People’s World Order; with the solution lying in local governance and local economies, so that the people have greater roles in determining the future and structure of their own political-economy, and thus, their own society. With this alternative of localized political economies, in conjunction with an unprecedented global population and international democratization of communication through the internet, we have the means and possibility before us to forge the most diverse manifestation of cultures and societies that humanity has ever known. The answer lies in the individual’s internalization of human power and destination, and a rejection of the externalization of power and human destiny to a global authority of which all but a select few people have access to. To internalize human power and destiny is to realize the gift of a human mind, which has the ability to engage in thought beyond the material, such as food and shelter, and venture into the realm of the conceptual. Each individual possesses – within themselves – the ability to think critically about themselves and their own life; now is the time to utilize this ability with the aim of internalizing the concepts and questions of human power and destiny: Why are we here? Where are we going? Where should we be going? How do we get there? The supposed answers to these questions are offered to us by a tiny global elite who fear the repercussions of what would take place if the people of the world were to begin to answer these questions themselves. I do not know the answers to these questions, but I do know that the answers lie in the human mind and spirit, that which has overcome and will continue to overcome the greatest of challenges to humanity, and will, without doubt, triumph over the New World Order. ANDREW MARSHALL is a Research Associate with the Centre for Research on Globalization based out of Montreal, Canada (www.globalresearch.ca). He has written extensively on issues imperialism in the Middle East and Africa, the environment, Homeland Security, war, terrorism and the global economy.